I’m sure you’ve heard it. For all the paranoids, the skeptics and the casual worry warts. 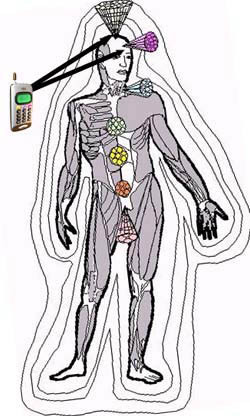 Cell phones may or may not give you cancer. Like cigarettes, at this point in time, no one really knows. In fact, no one will probably know for at least 40-50 more years. By then it’d probably be too late. Unless… you own a “radiation reducing” E-wave phone chip. Or so they claim. Introducing the E-wave chip, a product created by Omega, a Belgian health products company known predominately for their suntan lotion and wart treatments. The E-wave chip sells for $50 and is currently out in Belgium. You attach it to your cell phone and allegedly it will offset electromagnetic radiation and neutralize the rays caused by the electromagnetic signals… because you know, every time you use your iPhone, you’re big fat head apparently the antenna for harmful electromagnetic rays. The E-wave chip is expected to hit U.S. shores beginning 2009.